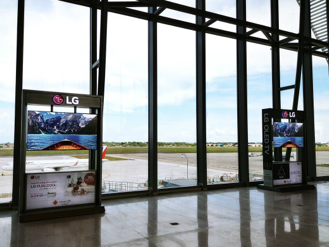 LG Electronics Philippines, the world’s leading OLED TV manufacturer, has on display its ultra-slim, 55-inch C8 OLED TVs at the newly launched Mactan-Cebu International Airport Terminal 2. Twenty-four units are strategically placed at the apron areas, departure check-in and departure gates, where dwells or waiting are high, and engagement can take on optimal possibilities. Every day, the new 65,500-square-meter terminal hosts thousands of passengers from various points of origin, from families on holiday to high-powered business executives. 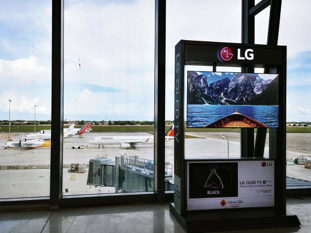 Travelers about to embark on an overseas adventure or those waiting for connecting flights are able to experience for themselves the breath-taking features of LG’s OLED TV. These best-selling OLED TVs employ the latest technology, guaranteeing the clearest, most realistic images in an unbelievably thin 4mm display. By setting intense colors against perfect blacks, it realizes a vibrant, true-to-life display while providing wider faster response speed. 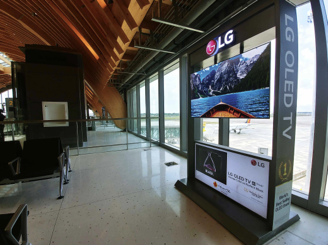 The OLED TV’s bold, razor-slim design also lends itself perfectly to an airport environment, with its wide viewing angle ensuring a first-rate picture from almost any viewing position. This is the first time OLED TVs are displayed in a Philippine airport. 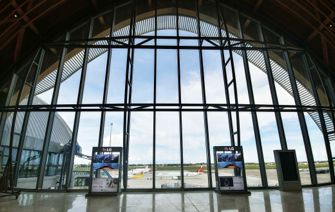 The Mactan-Cebu International Airport, styled as the country’s first resort airport, features soaring wooden arches fortified by steel ramparts and a wave-like roof that give the airport a tropical feel. Interior designer Budji Layug and world-famous Cebuano furniture maker Kenneth Cobonpue helped conceptualize the terminal. Terminal 2 started commercial operations last July 1.